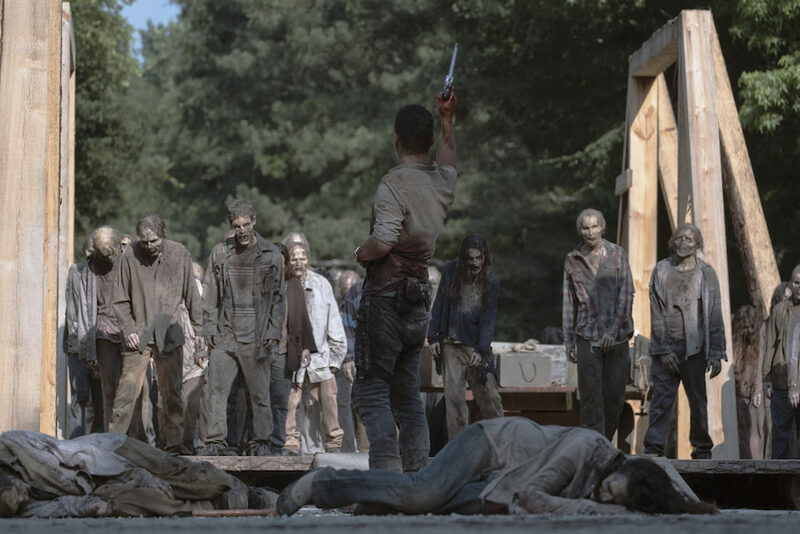 The Walking Dead has said goodbye to Rick…for now. As he exits the series, there are three AMC original films on the horizon to continue his story, but what does that mean for his “death”? I can’t say that I’m surprised that AMC will keep a hold of Andrew Lincoln for a little while longer in the form of an original movie series. Currently, Lincoln is signed on for a three movie deal that’s exclusive to AMC, and they maintain that he won’t return to The Walking Dead in the future. So, what does this mean for his “death” episode and how that challenges who Rick is? To recap, Rick spent “What Comes After” looking for his family, and he finally understands that he’s found them at the end. That’s when he attempts to make the ultimate sacrifice by blowing up the bridge (his perfect future) and stopping the herd. In the process, he’s swept away, too. Anne/Jadis finds him and makes a trade with the helicopter people to save him. The last we see of Rick is him being flown away to wherever the helicopter people live. No matter what happens from this point on, the group will mythologize Rick Grimes. He’ll become a larger-than-life hero to coming generations, and that’s what he deserves, too. This choice also opens up the narrative. It allows for other stories to play out without the pressure of keeping Rick in the narrative loop. It allowed Rick to decided how he went out, too. The only other person with that much agency in their death has been Sasha. With the film deal, though, it causes some issues. 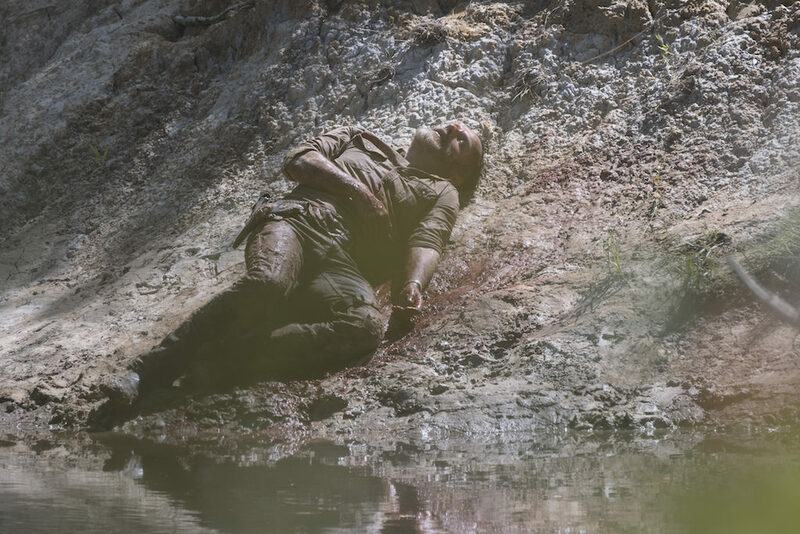 Rick’s death isn’t a true one, so the emotional impact of the scenes and his sacrifice is tainted by the fact that he’s out there, somewhere, alive. He’s fighting new battles and dealing with new people. All the while, the family he loves is under the impression he’s dead. Will Rick try and get back to them? This man searched for his family to start the series and left the series looking for his family. So, you mean to tell me that at some point Rick isn’t going to try and get back to them? I don’t care if Ghost Shane reiterated to all of us that Judith isn’t really Rick’s blood. That’s still her dad. He’d attempt to see her again. The same with Michonne. Rick would want to get back there. There are few details about the films right now, so all of these questions could very well be answered in time. However, I feel like AMC used the bait of Andy leaving the show as a way to emotionally manipulate their audience. We didn’t need to know the exact episode of his last appearance. That was purely a ratings grab. I’m more than happy to wait for the films, and hopefully receive the answers to these questions, but I’m remaining cautious. The Walking Dead has proven time and time again that when they widen their scope, the writing suffers. Which begs the question, just because you can do something, should you? What did you think about Rick’s exit from the show? Let us know in the comments below!